The fall of the last major rebel-held town of Mullaitivu in north-eastern Sri Lanka has further raised questions over the ability of Tamil Tiger rebels to withstand the current Sri Lankan military offensive in the coming weeks. Since the beginning of January, the rebels have lost their de facto capital, Kilinochchi, Elephant Pass, a land bridge that links the Jaffna peninsula with the mainland and recently the coastal town of Mullaitivu, which acted as one of their key military bases. Now the rebels or the Liberation Tigers of Tamil Eelam (LTTE) will be confined to smaller towns, villages and in the jungles in the north-eastern region. After having attained unprecedented success in its fight against the rebels, the Sri Lankan military is unlikely to give them any breathing space. The military says it has now cornered the rebels on all three sides and the rebel-held area is fast shrinking. The army says the rebels are now holding less than 400 sq km of territory. The Tamil Tigers still control about 30km of coastline. The Sri Lankan navy has deployed its naval vessels along the north-eastern coast to prevent the rebels from escaping by sea. 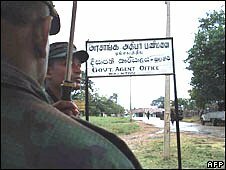 Mullaitivu was not only the last major rebel-held town in the north-east but also acted a crucial military supply base. "The LTTE's main supply route, especially military equipment and hardware, were supplied through Mullaitivu," Dharmalingam Siddarthan, a former Tamil militant turned politician, told the BBC. 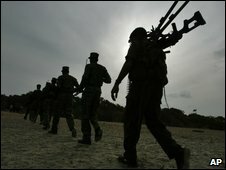 Sri Lanka's government is confident of victory in the war, which began a quarter of a century ago. Some officials have predicted the army will completely recapture the north from the Tamil Tigers in the coming weeks. So, why are the Sri Lankan forces winning now? The political leadership is strongly backing the military, which has nearly doubled its numbers in recent years. The government has also increased the firepower of security forces by buying new arms from Pakistan and China. In addition to this, the army has changed its tactics and become better able to cope with the kind of warfare waged by the guerrillas. It also started to stretch them thin by opening up a number of fronts in the north. However, many military analysts believe that the army may need thousands of additional soldiers to hold on to the territory it had recaptured from the rebels in the long-run. The Tigers have shown resilience in the past and with most of their heavy weapons and cadres intact, they may spring a surprise. Even if the rebels lose control of other smaller towns and villages in the remaining areas, they may revert back to guerrilla warfare. Now, the key question is what has happened to the Tigers' leader Velupillai Prabhakaran. Sri Lankan officials think he may have fled the country. But speaking to the BBC Sinhala service, senior rebel leader B Nadesan said it was nothing but malicious propaganda and their leader was very much within the north-east leading the movement. He also shrugged off recent military setbacks saying "in the past we have withdrawn many times and bounced back to achieve big victories". Many Tamils here warn that the capture of territory from the rebels alone will not end the ethnic conflict and that they need a political solution for a lasting peace. "Everything depends on the government. If it fails to devolve powers to the Tamil-dominated north and east after sometime the same problem will come up again," warns Mr Siddharthan. But the Sri Lankan government says it is working on a political solution and it requires time to evolve a consensus among political parties in the south. "The political solution is evolving as we watch in Eastern province. We've had elections and had a chief minister, who's a Tamil and a former child solider being elected to office. This is part of the political process," says Sri Lankan Foreign Secretary Palitha Kohonna. "If anybody were to expect the revelation of a political solution in one morning it is not going to happen like that. It will happen slowly. It will be an evolution rather than a sudden declaration," says Dr Kohonna.